Vegetarian lasagna recipes are some of the best lasagna recipes you will ever find. And we hope that our terrific lasagna recipes will hit the spot for you! These really are some of the best we have ever tasted - and we've tasted a lot. The absence of meat doesn't mean an absence of flavor. To the contrary, vegetarian lasagna might be even more flavorable! You get the goodness of all the veggie and pasta ingredients melding together and not overpowered by anything else. Grab some crusty bread and your favorite red wine and enjoy some truly remarkable, easy to make and fun to eat lasagna recipes! Black bean lasagna is one of our absolute favorites. This lasagna recipe is just right. It isn't too heavy and has a distinctive yet mild southwestern flavor. 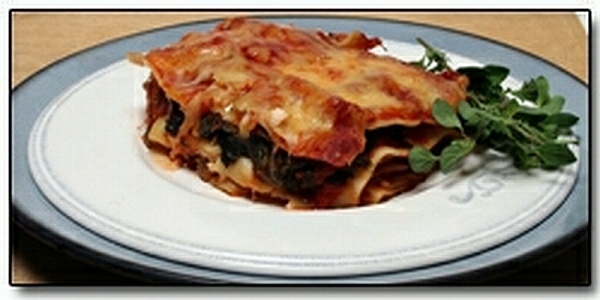 Our Black Bean Lasagna recipe is very popular. This lasagna recipe has enough Southwestern flavor to give it a nice "zest" but it isn't overpowering. So, it really goes with any style meal, and we often recommend it especially for a vegetarian holiday meal. We think you are going to say this is one of your favorites too! green pepper, salsa, chili and onion powders and cumin. tofu), garlic powder and egg. 12 to 15 minutes before serving. Try this tasty lasagna recipe - loaded with tasty mushrooms that really give it a distinct flavor and texture! Preheat oven to 375°. In a medium bowl, mash the tofu. oregano, pepper and salt. Mix until smooth. Using a medium skillet, heat oil over medium-high heat. 5 to 6 minutes. Drain any excess mositure. noodles. Spread some tofu filling on top of the noodles. layers of noodles, ending with the last of the sauce. until the casserole becomes "bubbly". Remove from oven and let stand for about 20 minutes before slicing. hydrates, 15g. protein, 1g. dietary fiber, 706mg.sodium. Here is a very simple but very delicious lasagna recipe submitted by our friend Amanda! Iin large bowl combine ricotta, spinach, mozzarella, 2 tbsp parmesan, and eggs. In a 15X9 baking dish spread 1 cup marinara sauce. Layer 4 noodles over sauce. top with 1/2 cheese mixture, 1 cup marinara sauce. Layer 4 more lasagna noodles, remaining cheese mixture, & remaining marinara sauces. Top with last 4 noodles. Spread alfredo sauce evenly on top; sprinkle with remaining parmesan. Cover and bake for 40 min. Uncover and bake an additional 15 min or until hot and bubbly. Let stand 10 min before cutting. Preheat oven to 375°. Heat oil in a large skillet over medium heat. Add onion and garlic and cook until onion turns opaque(about 4 min.). constantly (about 3 or 4 minutes). reserved marinara over the top and sprinkle with Parmesan. baking another 12 to 15 minutes. Saute onion, garlic, celery, carrot, bell pepper, and zucchini in olive oil until vegetables are tender. Add spaghetti sauce, water, beef bouillon cubes, and uncooked pasta. Simmer, uncovered until pasta is tender. Check to make sure that sauce doesn't go dry, if it starts to, add water. When the pasta is al dente stir in the black beans. Combine ricotta, garlic, mozzarella, parmesan, parsley,and salt and pepper. Drip by spoonfuls into skillet, cover and turn heat to medium low. Simmer until ricotta is set. No need to boil and separate lasagne noodles with this vegetarian lasagna recipe. Instead, the dry uncooked noodles actually draw moisture from the sauce and cheese and soften during the baking process. brown. Add eggplant and oregano and stir. noodles. Top with a thin layer of sauce. Add all the spinach and another thin layer of sauce. Add another layer of noodles and sauce. top and continue baking, about 15 minutes. A tasty vegetarian lasagna made with lots of veggies! and spread evenly over the bottom. mozzarella cheese over the filling; repeat layers until used up. Bake at 350 degrees for 1 hour; allow to stand for about 15 to 20 minutes, to firm up, before serving. Serve with a green tossed salad and warm bread, if desired.